Some of the cast members for the July 28 Hee Haw Show at the Highland County Senior Citizens Center in Hillsboro posed for this photograph. 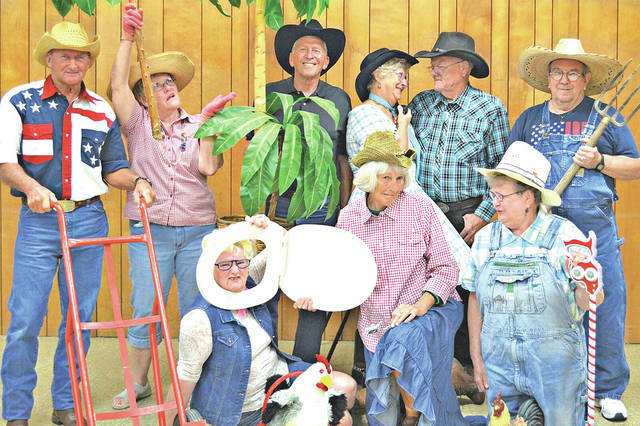 Whether it is a dozen people filing out of an outhouse, food served from Granny’s Rodent Roadhouse or a cooking recipe exploding toward the ceiling, you never know quite what you might see when the Highland County Senior Citizens Center hosts its annual Hee Haw Show on Saturday, July 28. The doors open at 5:30 p.m. and the show starts at 6:30 p.m. Tickets are $10 for the show. If you want a dinner of opossum (actually ham loaf shaped like a opossum), slaw, chips and sweet or unsweetened tea, there is an additional $5 fee. The meal will be served between the time the doors open and the show starts, and also at intermission of the two-hour show, when steak sandwiches and other snacks will also be available for purchase. During the hour before the show starts, cast members will walk around interacting with the crowd, and you might see a opossum walking around on a leash, senior center Director Mechell Frost said. The show, presented entirely by senior center members and staff, has been a staple of the facility for years. Frost said that after it was presented for several years there was break. Now, the show has been back for the last seven years, and even had a requested performance at the Blanchester Senior Citizens Center. Tickets are on sale at the senior center, located at 185 Muntz St. in Hillsboro, from 8 a.m. to 4 p.m. Monday through Friday, or online at www.highlandseniors.com with a small service fee. Other events coming up at the senior center include Bacon Bingo on Aug. 4, an Ohio Attorney General’s Office seminar on scams targeting older adults on Aug. 13, OSHIIP Medicare programs on Sept. 28 and Nov. 30, and a Healthy Halloween Senior Health and Information Expo on Oct. 23.